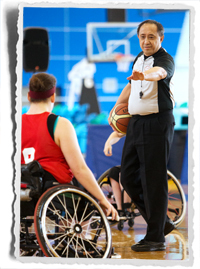 Officials, or referees, are certified technical officials whose role is to enforce the rules of wheelchair basketball. Opportunities to officiate wheelchair basketball exist from the local club level to provincial, national, and international championships and competitions. Individuals interested in becoming a wheelchair basketball official should contact their local Provincial Sport Ogranization?to get involved at the local level. For more information, individuals can also contact Wheelchair Basketball Canada. Wheelchair basketball in Canada is played in accordance with the International Wheelchair Basketball Federation (IWBF) rules which have been modified from Federation Internationale de Basketball (FIBA). There are some adaptations for play in the various divisions of the Canadian Wheelchair Basketball League (CWBL) to encourage development. List of active officials across Canada. Officials must complete and pass the Wheelchair Basketball Canada annual officials exam in order to be eligible for post-season assignments.